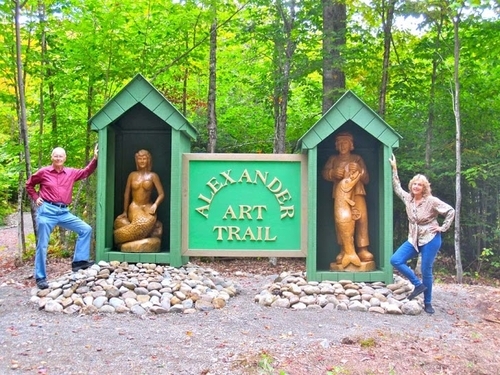 Alexander Art Trail (AAT) is a collaborative effort between a non-profit organization, a local landowner, various artists and volunteers.The landowner contributed a very long term easement on her land for the trail with option to extend. Some artists donated their works of art and labor. Other volunteers also helped to landscape the trail. 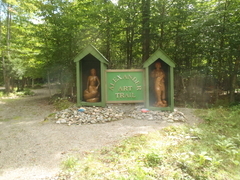 History Dome and Art Park, Inc., a non-profit organization incorporated in Maine,paid for the initial clearing of the woods, gravel work,construction of multiple outdoor display cases and provided the collection of hand-carved,imported sculptures. 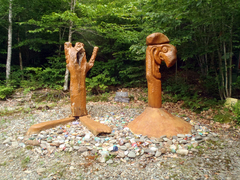 These life size, solid oak sculptures dominate our trail. 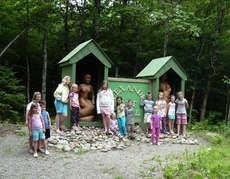 They were commissioned to complement the woods-and-lake location at the bottom of steep Breakneck Mountain. Customized, thick plank benches offer convenient rest stops and encourage viewing and reflection. We have relatively few abstract sculptures. Hence our exhibits differ from the more prevalent abstract art collections. Our lives often are affected by the relationships between human couples, as well as among pairs in the animal kingdom.When we meet a couple we almost instinctively evaluate them. Do the mermaid and fisherman represent romantic lovers who believe that love can overcome nearly all obstacles, even bridge huge environmental disparities, such as living on land or under water? Do the “Scaries” family members fit well into an eccentric suburb or will they have problems? He seems to have a three-headed split personality, she appears to be a plastic surgeons dream, and junior has a face only a mother or an ambitious child psychologist could love. Does the pair of owls look stuffy and barren or are they looking forward to hatching an egg or two? Will an accordion playing bear pacify a rifle toting hunter who has already shot another bear? 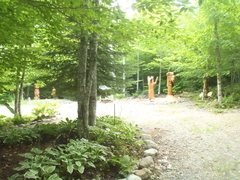 The far end of the trail is devoted to driftwood sculptures. Most belong to the “rejuvenation” or “collaborative natural art” categories. The former include the carved pieces. Such pieces of dead wood were given a new use, hence “rejuvenated”. The pieces which were selected without additional carving, or where the carving is minimal, such as the addition of an eye, can be considered as an edited version of Mother Nature’s prolific productions. Mother Nature modifies, sculpts many pieces but they often look very similar. It is up to the artist to collaborate, select, edit and perhaps slightly adjust a Mother Nature creation. Hence the “collaborative, natural art” label.